I wanted those hooks. I wanted them bad. My desire only got worse after I got to try out a friend’s but they weren’t at all in my budget. Not even a little. How could I justify the cost, even for such awesome hooks for my favorite hobby? And then I remembered: I already had a way to pay for them. With crochet. What do you do with your free time? What do you enjoy most? And how do you pay for it? Some of us have inexpensive hobbies and others enjoy pricier ones, but almost all of us spend at least some money on our hobbies. How much do you spend on your hobbies each month? How about each year? Go on, take a guess. You probably haven’t thought about cutting back on the costs of your hobbies because these are things you love. They give you joy. And what’s the point of having money if you’re not spending it on the things you love? I completely agree! And that’s a great attitude if you have a lot of money to spare. But if you had a lot of money to spare, let’s be honest, you probably wouldn’t be on this blog, right? So you don’t have money to spare, or you don’t have enough, anyway, but you don’t want to cut back on your hobbies. I feel you. So let’s do something about it and make your hobbies fund themselves! You’re probably wondering what the hell am I talking about. Let me give you a few examples. How to make your hobbies fund themselves. I love to knit and crochet. It’s fun and relaxing and I love making beautiful things with my own two hands. But yarn, hooks, needles, and other supplies aren’t cheap. And what do I do with the finished products? I can solve both of those problems by selling what I make! I don’t sell it all. I still make gifts for loved ones, warm winter wear to donate, and the occasional thing for myself. But I sell a lot of it, too. That covers my costs, gives me a little extra spending money, and assures that I’ll always have a destination for the finished products. You may have noticed my page on this site. When I wanted those hooks, I realized that if my hand cramped up less, I could make and sell more, and easily cover the cost of those hooks. So I bought them, and I was right; I’ve made back that money many times over. I also create my own patterns sometimes. When I do, I write them up so I can use them again later. As long as I’m doing that, I add in a few photos and then post them on craft sites for people to buy. I don’t make a ton of money off of them, but it’s very little work to make them and no effort to promote them. I’ve also gotten paid a few times to give lessons, though I usually end up doing it for free so I can spread the joy. I don’t make a lot of money off of any of these, but together, they cover my costs. It’s more than worth a little extra effort so that I can do more of what I love. You don’t have to sell a finished product, either. If you’re a runner, pay for sneakers and other equipment by being a coach. If you love to write, there are many ways to make money including selling an ebook or monetizing a blog. Are you a photographer? Sell your photos through flickr, istockphoto, another site, or on your own. Are you a movie buff? Find someone who will pay you to write reviews. A foodie? I know a couple who enjoy fancy meals regularly by writing restaurant reviews for a local paper. They’re currently working on setting up a web site of their own to post their reviews, too. If you garden, sell what you grow or offer lessons to others who want to learn. A coworker loved spinning (on a bike, but I bet the same would work for a loom.) Instead of paying for classes, she signed up to teach. Twice a week she would teach after her day job. Not only did she get to spin without paying for a class or a gym membership, but she knew she couldn’t skip out on the days she didn’t feel like doing it, so it kept her honest to her workout goals. Of course, those are just a few quick ideas that I came up with in 5 minutes. I’m sure you could find a way to make money from any hobby if you’re creative about it. The key is to do it in a way that suits you. If you hate writing, then writing restaurant reviews isn’t for you. But maybe making YouTube videos is. If you love to teach but hate to sell, then giving crochet lessons makes more sense than selling crocheted items. Maybe you can’t or don’t want to monetize one hobby, but you’re glad to make money off of another. Do what works for you. 1) Make sure you don’t turn your hobbies into a job unless that’s what you really want to do. 2) Keep track of how much your hobbies earn. Trust me, it’ll feel really good when you see those numbers adding up. 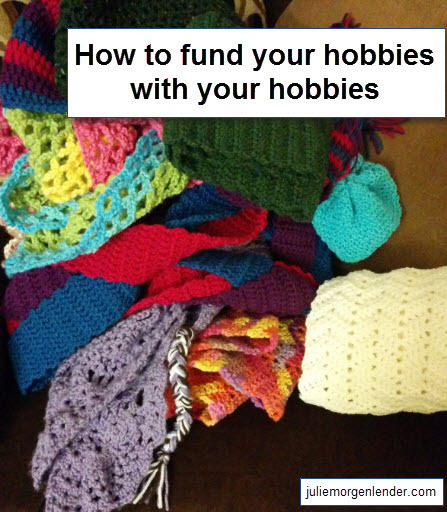 With some of these ideas you’ll easily fund your hobby and then some. With others it will be a stretch. The key is to cover your costs the best you can so that paying for your hobbies, especially if they’re expensive ones, isn’t a source of stress. After all, you’re doing these things because you have fun with them, so let’s keep them fun!